Someone was kind enough to tip me off to this story. Let me share how I approach something new like this. First I read it for what it says and what it doesn’t say. In this case, something called the Borowitz Report says that Fox News Anchor Shepard Smith quoted “sources close to the President” as saying that Obama is “increasingly nostalgic for the land of his birth.” Initial reaction: hmpf, third-hand anonymous source. At this point several strains of thought are going. 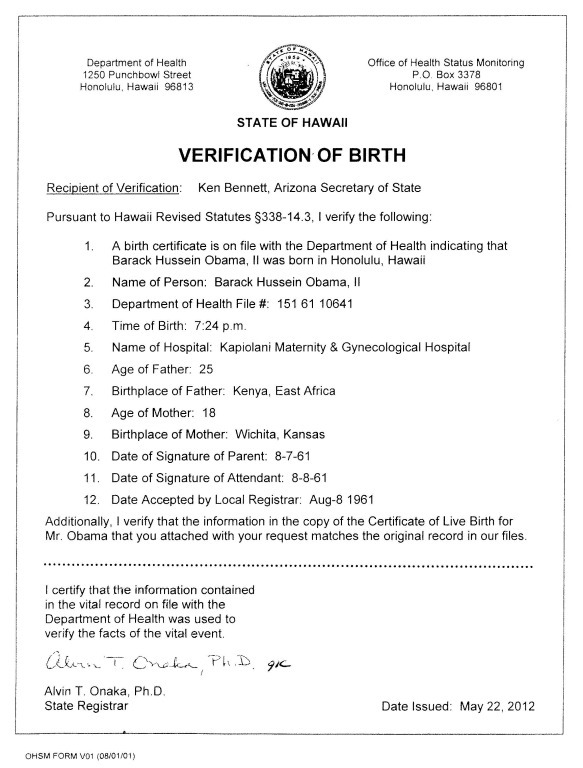 Is there anything from the anonymous source that links Kenya with “land of his birth?” Maybe Obama wants to go back to Hawaii. Did Shepard Smith really say any of this? What’s the value of an anonymous source in the hands of Fox News anyway? I recall that Shepherd Smith, last time I listened to him, was no birther. Check out this video from 2009 where Smith called birtherism preposterous and dangerous. Has Smith done a 180-degree turn in his thinking? My hoax alarm is ringing loudly at this point, and it would seem that a prudent first step would be to see if Shepard Smith ever said this in the first place. That’s not a happy task because simple search of the keywords involved is bound to return hundreds of birther blogs and comments quoting the story. To avoid being overwhelmed with junk, I’ll try searching Google News and Fox News first. Google News returned nothing relevant using keywords: shepard smith obama birth. I tried expanding the time period and using keywords: shepard smith obama birth kenya. Nothing close. So it’s not a true report. However, I fired off a few more Google queries and realized my mistake. You see, I lied. I only read MOST of the Borowitz article. I failed to read the last two sentences that make the joke obvious. In other debt ceiling news, by unanimous vote the House of Representatives passed a bill raising Speaker of the House John Boehner’s medication. As for the debt ceiling negotiations, they are “right on schedule,” according to the ancient Mayans. So that’s the true story of Dr. Conspiracy, the detour, and the joke. I came across something novel from the birther side this morning, an attempt by a birther to understand other birthers using psychology. In my July 11 article, Obama conspiracies and the grief cycle, I discussed how normals, when coming to grips with the birther movement, can follow the Kübler-Ross model, commonly known as The Five Stages of Grief. In a new article yesterday prolific commentator William Lolli (pictured above) applies the same model to the birthers, in his article, Confessions of a Birther Evangelist at The American Thinker. Many politically active Birthers are stuck in the anger stage. You can see that by reading their blogs, letters to editors, emails to congressman, and their use of invectives like "long legged Mac Daddy," "Usurper," "Traitor," and the like. The ad hominem attacks do little to persuade, but they do provide emotional relief to the mass of frustrated Birthers, who find it difficult to understand why the legal and moral clarity of their arguments are systematically ignored. What Lolli doesn’t understand is that birthers are ignored because their arguments lack a factual basis and legal clarity not in spite of it. Rather than realizing that only 5% of the population is convinced1 Barack Obama was born overseas implies that the argument is essentially unpersuasive, Lolli explains it as “herd instinct” among the normals. I think Mr. Lolli is in denial. …the perception that the entire system of government is corrupt, there is no regard for the law or the Constitution, and any illegal alien or naturalized citizen can argue that he can be president without regard to Article 2, Section 1, Clause 5. Lolli’s article at the American Thinker is one I recommend that you read. He is probably one of the best writers the birthers have. His article is an insight into how a thoughtful person views the world while still trapped in the birther alternate reality and underscores the fact that smart people still get sucked into conspiracy theories. 1The 5% number is the number who “definitely” believe Obama was born overseas according to a Gallup Poll taken after President Obama released his long-form birth certificate. I was teasing one of the commenters here by deliberately misinterpreting a comment of his referring to intelligent design and replying that I didn’t consider intelligent design a conspiracy theory. However, I really do. Writers on conspiracy theories delineate two general ways to explain the world: The Forrest Gump theory ([stuff] happens) and the conspiracist explanation (nothing happens without a reason). The former believe that there is chaos in the world and that chaos, coupled with natural processes and people following their own interests, explain what happens. The latter see deep underlying structure in things, connections between events and the hand of conspirators pulling the strings from behind the stage. Writers on the psychology of conspiracy theory suggest that those in the former camp are less prone to see patterns in random events and that they are more comfortable with uncertainty compared to the latter. At this point in the story, the reader should have figured out where I’m going. “Undirected process” is the Gump theory and “intelligent cause” is the approach of the conspiracy minded. The Orange County Register, a conservative newspaper in California and the home county of Orly Taitz, published an interesting and detailed story yesterday, and updated today, by Martin Wisckol titled Norway killer’s conspiracy theories bubble in U. S. The article discusses a June GOP Flag Day event at which Bill Whittle gave a warmly-received talk about culturally-diverse socialist conspiracy including Barack (Manchurian Candidate) Obama. From what I can tell, there is little in (Breivik’s) thinking that would connect him with most American extremists, beyond hostility toward Islam and cultural diversity. Fifteen or 20 years ago, these issues never would have entered the mainstream dialogue. That’s because the mainstream media censored things that had no discernible evidence behind them. The Register points out that with Cable TV and the Internet, more people are exposed to these ideas. The article then goes on to discuss conspiracy theorists in Orange County. DC District Court Chief Judge the Hon. Royce C. Lamberth has dealt with the Orly Taitz problem. 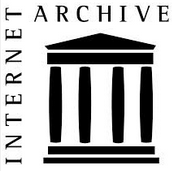 After castigating her for her repeated inability to grasp the concept of blanking out the first 5 digits of a social-security number, he allowed her 78-page motion in opposition to the government’s motion to dismiss her FOIA lawsuit against the Social Security Administration to be filed, ordering that Exhibit 9 which still contained improperly redacted information be filed under seal. 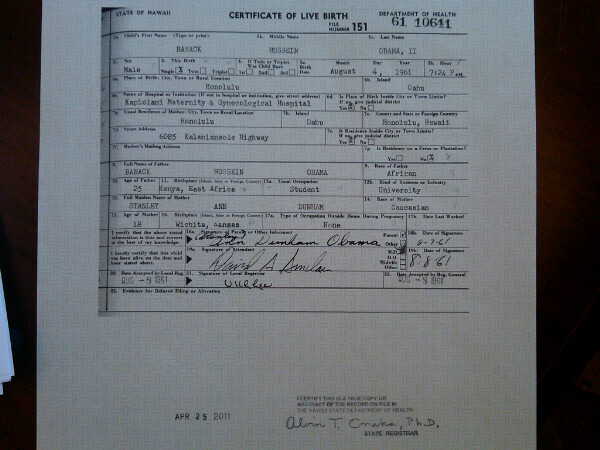 Our intrepid “band of birthers,” Orly (“Let me feenish”) Taitz, Paul (“I know typewriters”) Irey, and Douglas (“Scanners? 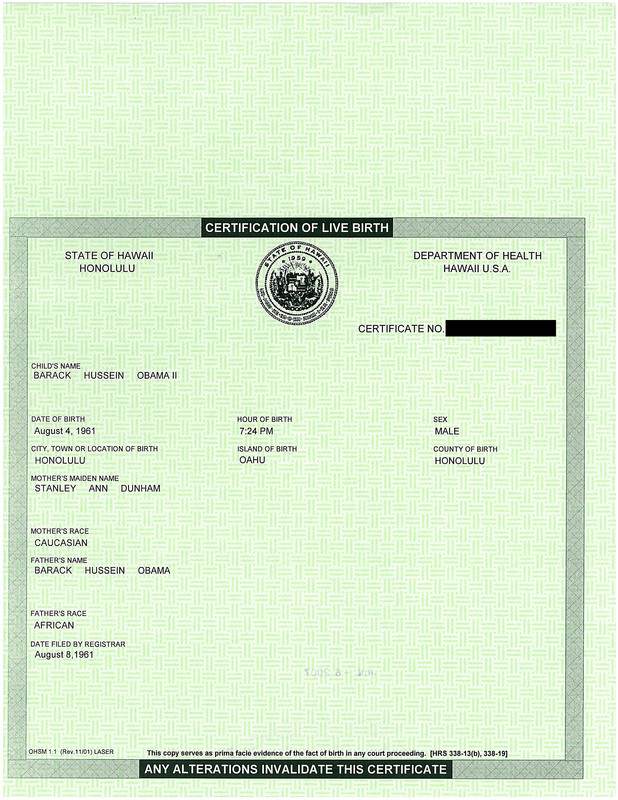 What a deal have I got for you!”) Vogt, is heading to Hawaii in just over a week with a laptop and a portable scanner to view and copy Barack Obama’s long-form birth certificate, reports WorldNetDaily. 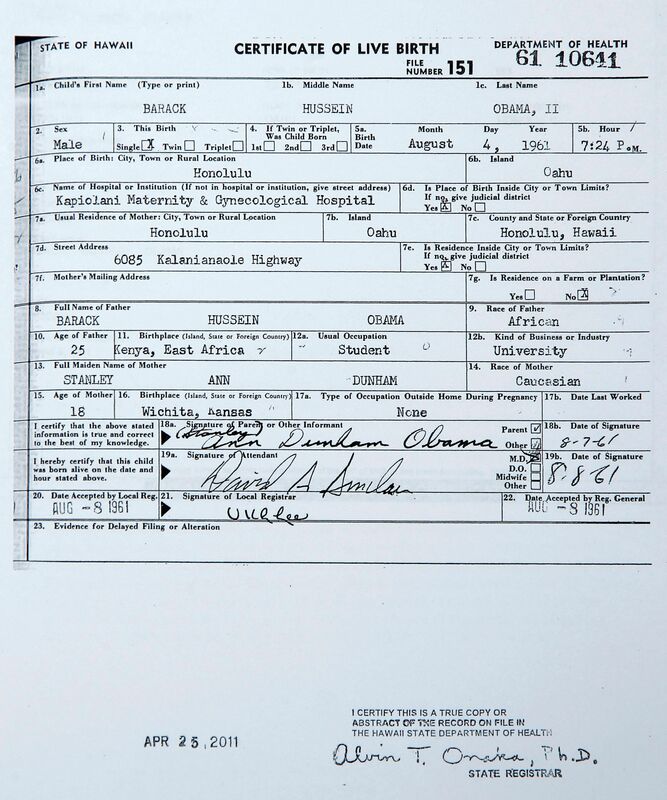 The Taitz subpoena from the Taitz v Astrue lawsuit, specifies August 8, the 50th anniversary of the registration of Obama’s birth by the Hawaii Health Bureau, for the viewing. I’m afraid it’s going to be Kona weather1 for our travelers2. The State of Hawaii has already said in a response to an earlier Taitz subpoena that Hawaiian law prohibits them from complying, even if the subpoena were valid. I personally did not arrange any press conference, as I expect last minute stone walling. It is my understanding that a New York Times reporter made plans to be there, but I have nothing to do with this preparation. Right now I am swamped over my head with a million things. My father is having a minor surgery and I do not expect to be in HI till the last moment. I am still having to spend enormous amount of time on this bogus law suit filed by Philip Berg, his local counsel Gary Kreep and his sidekicks Lisa Liberi and Lisa Ostella. This is an enourmous [sic] waste of my time, money and energy, which could have been used for something much more important, but the courts want me mirred [sic] in this for over two years now. I am sorry, I missed the interview on KOCE 1000. I did not sleep last night, had a terrible migraine and missed the call. I will record the interview and they will play it later or I will do it live in a couple of weeks. 2One Taitz commenter, Florence Stone, says that the Hawaii Deputy AG in charge of responding to the subpoena is on leave and that Health Director Fuddy had “left the island.” That was a couple of weeks ago.